As I pulled into Oily Souls last year, I found myself backing in next to a refreshingly unique bike that I had seen around a few times. I had never met the owner. Little did I know that we would end up becoming good friends. I finally met Brant Panchenko, the man behind the bike, when I organized the Ghetto Shakedown ride through Detroit. When we met, we instantly bonded over bikes, work ethic, and a similar outlook on life in general. 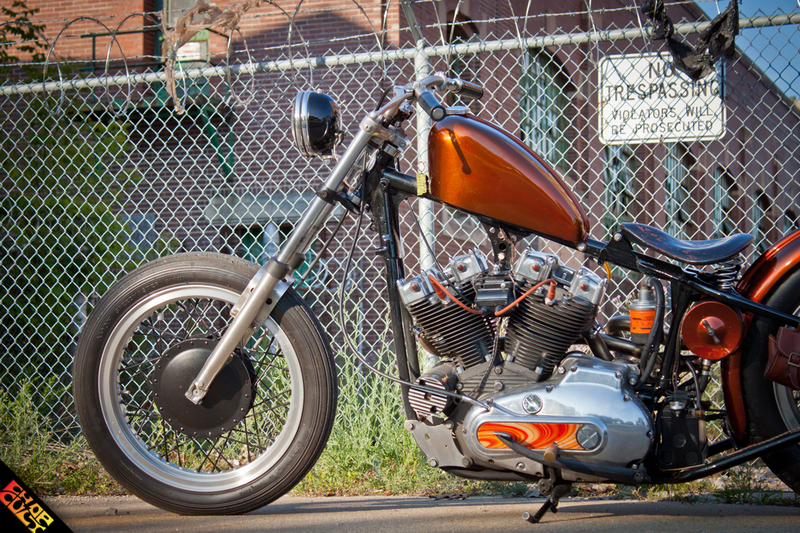 When I was asked to become a ChopCult contributor, I knew right away that Brant’s bike was the first bike I wanted to shoot. 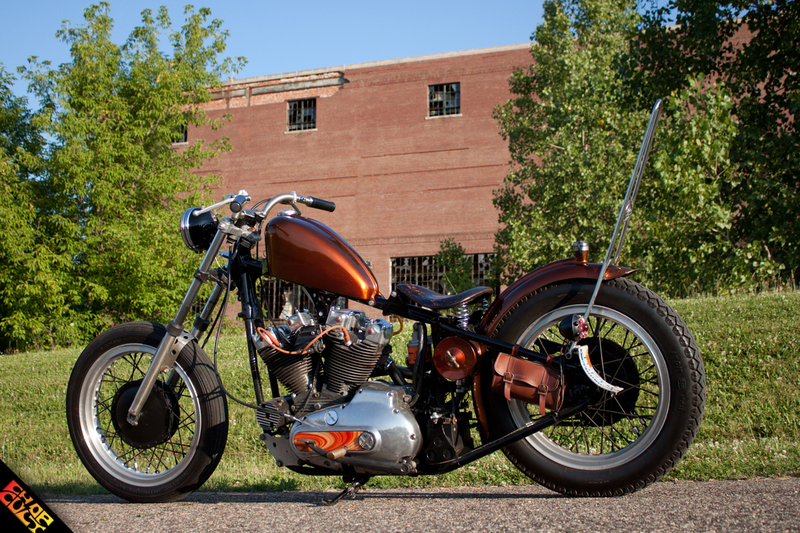 This is not only because of the creativity and craftsmanship that went into the build, but the purpose of the bike itself. Brant is a firm believer that you build something to ride, not to just show off. I admire the abuse he puts his chopper through on the mean streets of Detroit. Chassis mods: Custom hard tail handmade by Ry Seidler (RAS Moto) and myself. 4” drop and 4” stretch in the rear. Front down tubes lowered 4” as well. Favorite thing: It’s always been in my family. My dad bought it new in 1972. I also love riding the hell out of it. Next mod: Fresh paint, new tires, and a kicker when I’m not too cheap to buy one. Other mods: There are only three major parts I bought for the build. The Fram oil filter mount, Cycle Electric generator, and a cheap megaphone style muffler. All other parts are either original, modified original or handmade. 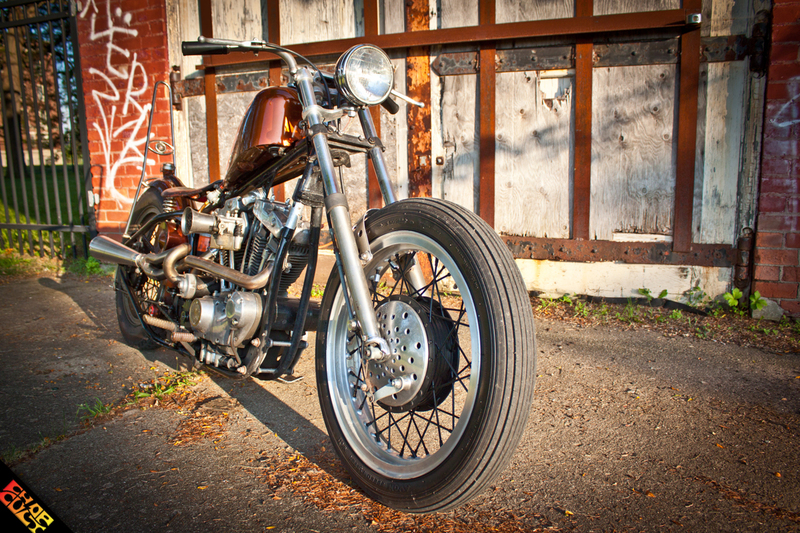 Most prominent features include handmade rear fender with integrated oil tank and unique filler. 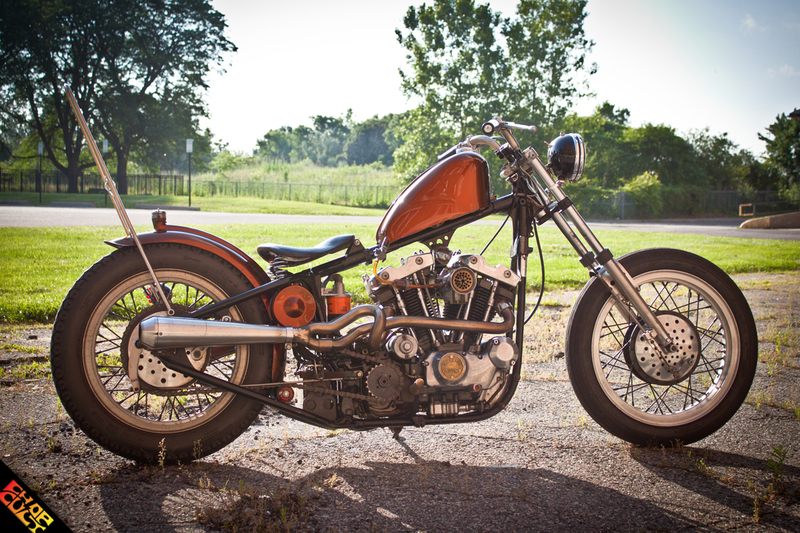 Handmade equal length exhaust, chopped buckhorn bars and chopped cam and sprocket cover. Building/riding story: I grew up on the back of this bike. It sat parked many years due to a sheared main shaft key. It was given to my brother who had intended to restore it, but managed to turn it into a basket case. After I was eventually given the bike, I took it to Ry’s in buckets (literally) and we started chopping. Special thanks to my Dad, brother and especially Ry. There are a lot of cool features on this bike. I especially like the use of marbles for the lights. Good stuff! The fender/oil tank is unreal. Some really trick stuff on this thing. Awesome build, Brant. 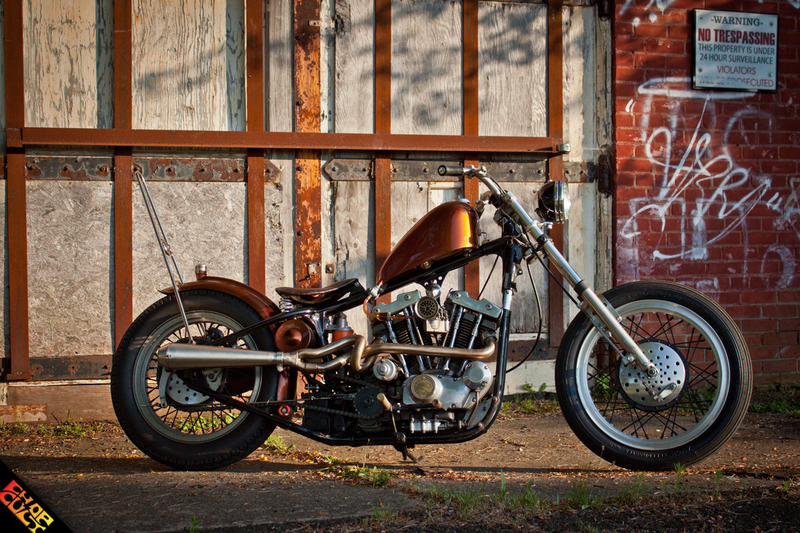 Great lines in the frame and the sissy bar matching the pushrods is boss.. The skate wheel is the most tasteful skate x chopper incorporation i've seen yet! well built really dig it . how is it in the rain with the holes in the drums ?